When I joined UNDP as Administrator in June of 2017, I was pleased to be taking the helm at the world’s leading development organisation. I had inherited from my predecessor, Helen Clark, a strong organisation that was recognized the world over for its transparency and bold action. It was then, and is still, an organisation with a proud history of more than a half-century of helping countries in every corner of the world to fight poverty, create jobs, administer elections, prevent disaster, and recover after crisis. Our thousands of staﬀ dedicate themselves every day to working with partners to achieve this and more. As we continue this work, the world is facing a set of unprecedented challenges. A staggering 650 million people are living in extreme poverty — about 16% of them in fragile countries. Three billion people are using dirty sources of energy for cooking and heating. Every year, US $1.26 trillion is lost to corruption. 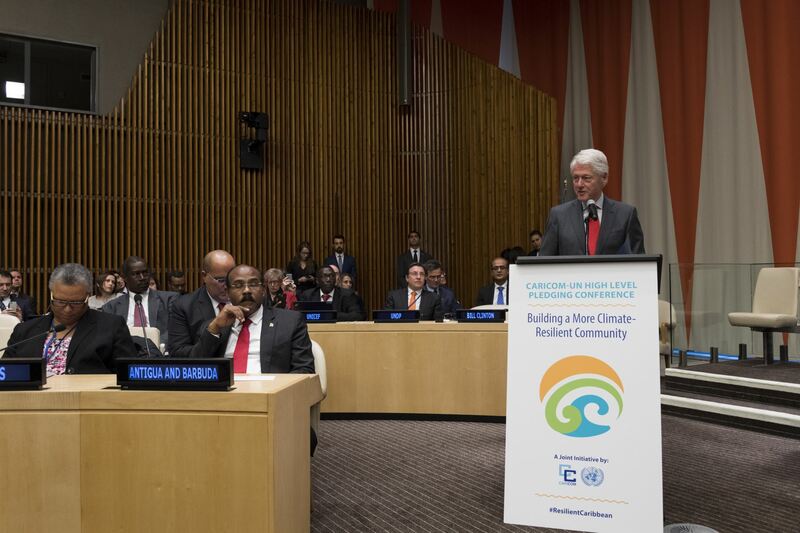 In the past decade, 700,000+ people have been killed in climate-related disasters. There has been a 50% increase in CO2 emissions since 1990. Only 23.5% of the world’s parliamentarians are women. The challenges we face can seem overwhelming, and the temptation to give in to a dark vision of our future is great. But there is much room for optimism. 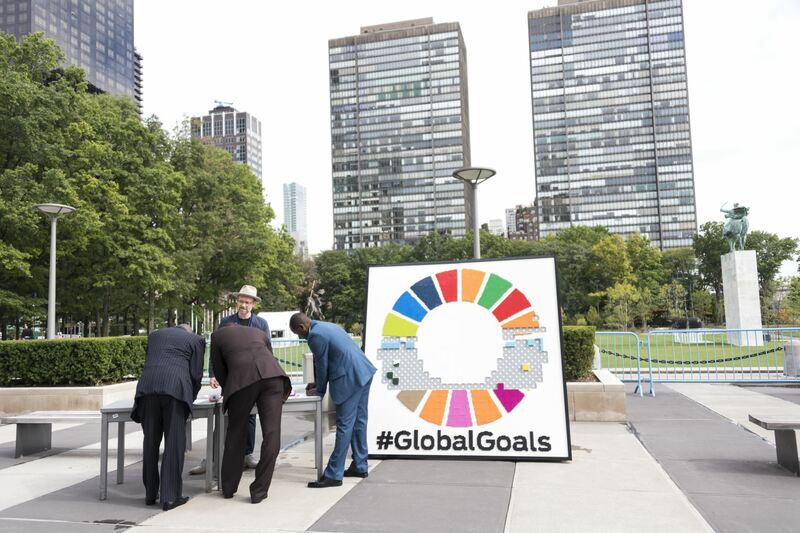 We can take heart that every country in the world has committed to a bold plan — the Sustainable Development Goals set out in the 2030 Agenda — to end poverty, fight inequality and tackle climate change. Recognizing this context, the United Nations, led by Secretary-General António Guterres, is undergoing system-wide reforms to remain eﬀective even as more and diﬀerent demands are made of it. The universal commitment to the Sustainable Development Goals and UN reform together present UNDP with a tremendous opportunity to help countries become more peaceful and prosperous. That’s why UNDP is transforming for a new era of sustainable development. Our innovations and reform are described in our new Strategic Plan 2018-2021, the frst plan to be conceived and carried out entirely in the era of the Sustainable Development Goals. The Plan identifes six ‘Signature Solutions’ that build on our strengths as an organisation; we will use these solutions to focus our resources and expertise, and make a real impact on poverty, governance, energy, gender, resilience, and the environment. We understand that development does not happen overnight, but is nevertheless urgent. With a network encompassing 170 countries and territories, we are supporting governments across the globe as they transform societies. UNDP will do this work with the rest of the UN system and our partners. We remain committed to the highest standards of transparency and accountability to the people, governments, institutions, and organisations with which we work. With a more dynamic UNDP oﬀering even more support to countries on the frontlines of the biggest challenges, we will take another step towards achieving the Sustainable Development Goals. FROM HELPING PARTS of Iraq to stabilize after conﬂict, to supporting historic open elections in Zimbabwe, to our work in the Maldives on climate change, and building a lasting peace in Colombia, UNDP helps 170 countries to reach their development priorities so that no one is left behind. The Strategic Plan is an essential tool for UNDP to continue to evolve and adapt over the next four years to drive strong progress towards the Sustainable Development Goals (SDGs). UNDP plays an essential role in the development work of the larger UN system. The UNDP Administrator is the Vice-Chair of the UN Sustainable Development Group, which unites the funds, programmes, specialized agencies, departments and offices of the UN system that play a role in development. The UN Sustainable Development Group is instrumental in enabling action on the ground and ensuring that UN Country Teams have the support, guidance and impartial oversight required as they help governments deliver on the 2030 Agenda. A set of integrated responses to development in the following areas: poverty, governance, resilience, environment, energy access, and gender equality. Each Solution includes a mix of policy advice, technical assistance, finance, and programmes. Today’s challenges are complex and each country is different. That’s why we tailor our work to fit the needs of the countries we serve. Support within and across countries: Our new Global Platform leverages expertise from around the world to support individual countries, and a Country Support Platform in each country harnesses the collective policy and covening power of the UN, and ramps up innovations for development. We’re boosting our performance to maximize return on every dollar invested. What’s more, we’re harnessing cutting-edge technologies and research to generate new ideas to test and scale up. To better focus its resources and expertise to deliver on the 2030 Agenda, UNDP has identifed a set of approaches that we call our Signature Solutions. No one solution will succeed on its own. We need all of them to achieve the SDGs. Each solution has the potential to unlock the path to sustainable development. UNDP’s Signature Solutions are cross-cutting approaches to development— for example, a gender approach or resilience approach can be applied to any area of development, or to any of the Sustainable Development Goals. The matrix above shows how the Signature Solutions interact with our work on the SDGs. On the following pages, you’ll see stories of the six Signature Solutions at work. Spanning the five regions where we work, these stories illustrate the experience, dedication, and innovation that UNDP applies to the task of achieving the SDGs. Today, 650 million people live in extreme poverty, while another 800 million are at risk of falling back. People stay in or fall back into poverty because of a range of factors—where they live, their ethnicity, gender, a lack of opportunities, and others. Ending poverty is UNDP’s primary focus and features in our work with governments, communities, and a wide range of partners in all of the 170 countries and territories where we operate. UNDP interventions help eradicate poverty, such as by creating decent jobs and livelihoods, providing social safety nets, boosting political participation, and ensuring access to services like water, energy, healthcare, credit, and productive assets. Our Signature Solution on poverty cuts across our work on all the SDGs, whether it’s decent work or peace and justice. In the former Yugoslav Republic of Macedonia, UNDP and the government set up an ambitious programme to help long-term unemployed people start their own businesses through coaching and start-up grants. Since 2007, nearly 10,000 new businesses have been created, 35% of them run by women entrepreneurs and 31% by young people. A remarkable 70% of these companies have remained active beyond the initial five years, and many have expanded. In 2017, the scheme accounted for 15% of new private-sector firms registered in the country. Even before conﬂict erupted in 2015, Yemen was one of the poorest countries in the Arab region. Now, after three years of fighting, there is widespread hunger. UNDP’s cash-for-work projects get people back to work and help restore roads and other infrastructure. In partnership with UNICEF, we’ve helped create short-term jobs for over 400,000 people, boost small businesses in agriculture and fishing, and train young people as health and sanitation promoters. That way, Yemenis can look forward to a safer and better future. The Government of India has an ambitious plan to build 30 million houses by the year 2022. With UNDP’s support, the government is creating 130 designs for houses to fit India’s diverse housing needs and that use local materials to reduce the environmental footprint of housing. Thirteen states are now building “demonstration” houses to encourage families to adopt locally appropriate building materials. Engineers and architects are offering various styles that can be adapted by families so their houses feel more like homes. On the occasion of the 20th anniversary of the Human Development Report, UNDP partnered with the UK based Oxford Poverty and Human Development Initiative to develop the Multidimensional Poverty Index to make more sophisticated measurements of global poverty. UNDP is partnering with the World Inequality Lab, based at the Paris School of Economics, to promote research on global inequality dynamics, such as the World Inequality Database and the biennial World Inequality Report. UNDP works with partners in Rwanda to inspire, and train young entrepreneurs and provide them with the tools they need to succeed through the YouthConnekt project. The project offers a boot camp on business skills, and an annual competition for cash awards and other support to help the best business plans scale up; it has created nearly 4,000 jobs. UNDP is now supporting expansion of the project to 14 other African countries. People’s lives are better when government is efficient and responsive. When people from all social groups are included in decision-making that affects their lives, and when they have equal access to fair institutions that provide services and administer justice, they will have more trust in their government. The benefits of our work on governance are evident in all the areas covered by the SDGs, whether it’s climate action or gender equality. UNDP’s governance work spans a wide range of institutions, from national parliaments, supreme courts, and national civil services through regional and local administrations, to some of the geographically remotest communities in the world. We work with one out of every three parliaments on the planet, and assist in an election somewhere in the world on average every two weeks. We help countries expand spaces for people’s participation, and improve how their institutions work, so that all people can aspire to a sustainable future with prosperity, peace, justice and security. More than three decades of armed civil conﬂict in Guatemala left hundreds of thousands of people dead or missing, and generations of people scarred. UNDP is supporting government and non-profit organisations to reconcile with this violent history. One UNDP-supported project, “The Room of Absences,” is part museum, part educational centre, and part memorial. Visitors leave the experience transformed and committed to helping build a lasting peace. The project is part of UNDP’s work in the country to strengthen institutions and popular support for peace and human rights. The Amazon is populated by thousands of indigenous communities, some of them extremely isolated and under constant threat. A key step to help indigenous peoples defend their territories is the recognition of their land rights. UNDP is working with the government of Peru and communities to secure recognition of land rights for nearly 70 indigenous communities in three regions of the Peruvian Amazon, helping to conserve more than 300,000 hectares of forest. By recognizing communities’ rights over their ancestral territories, Peru is also fighting against climate change by avoiding deforestation. In 2017, UNDP launched “Journey to Extremism: Drivers, Incentives, and the Tipping Point for Recruitment,” a seminal report on violent extremist groups in Africa, which were responsible for 33,000 deaths between 2011 and 2016. The report was the result of a two-year study that explored the life histories and personal perspectives of extremists. The study showed that the more prosperous and fair the community, the less likely it is to produce violent extremists. UNDP uses research, public education and other methods to tackle the root causes of violent extremism in Africa. In tandem with the report launch, UNDP also released Stories of Survivors, a hardcover book of photos and testimonials. UNDP has a longstanding partnership with the European Union (EU) to promote good governance and make societies more inclusive and resilient. Together, UNDP and the EU are among the largest providers of electoral assistance worldwide, helping countries carry out credible elections and boost women’s participation as voters and candidates. This partnership helps millions of people worldwide gain better access to justice and public services, especially in areas affected by conﬂict or crises. In Malawi, UNDP is the lead partner supporting the Government’s new system to register and provide identifcation to the country’s residents. Using the latest biometric technology, the new system will help guarantee that all Malawians can enjoy access to services and the full rights of citizenship. Registration began in May 2017, with the target of registering 9 million Malawians above the age of 16 by year’s end, and creating an automatic registration process for the future. This landmark project will serve as a model for other countries that wish to use biometric technology to register citizens. Crises know no borders. During the past decade, over 1.5 billion people have been affected by disasters, and that number is likely to increase with climate change. More people have been uprooted from their homes by war and violence and sought sanctuary elsewhere than at any time since the Second World War. Poverty, population growth, weak governance and rapid urbanization are driving the risks associated with such crises. UNDP helps reduce these risks by supporting countries and communities to better manage conﬂicts, prepare for major shocks, recover in their aftermath, and integrate risk management into their development planning and investment decisions. The sooner that people can get back to their homes, jobs, and schools, the sooner they can start thriving again. Resilience building is a transformative process of strengthening the capacity of people, communities, institutions, and countries to prevent, anticipate, absorb, respond to and recover from crises. By implementing this Signature Solution, we focus on capacities to address root causes of conﬂict, reduce disaster risk, mitigate and adapt to climate change impacts, recover from crisis, and build sustainable peace. This has an impact that not only prevents or mitigates crises, but also has an effect on people’s everyday lives across all SDGs. After Georgia was hit by major ﬂash ﬂoods, UNDP helped develop a ﬂood resistance plan for the Rioni River basin, the most ﬂood-prone area in the country. The programme has helped set up a modern early-warning system, built dikes along the river banks, planted forests, and created a zoning plan to climate-proof buildings and farms. The initiative paved the way for a programme to protect 1.7 million people from ﬂoods and other climate risks. UNDP is supporting recovery efforts by the Government of Iraq in the country’s second largest city, Mosul, recently freed from the Islamic State in Iraq and the Levant. Among many other projects, UNDP is helping rehabilitate buildings at the University of Mosul, a vital road from the city to a nearby hospital, and water treatment plants that provide safe water to over 600,000 people. All told, these projects are giving the people of Mosul more reasons to return home, and the basic services they need to stay. Because of climate change, 80% of the islands in the Maldives are only one metre above sea level, and scientists predict that most of the islands will be submerged by 2050. Traditional risk maps provide essential data required to inform emergency-response plans, but they take a long time to create. UNDP and the Government of Maldives are working together to use drones for mapping — a much faster process that yields 3D maps. Drone mapping will provide critical information to help protect the 400,000 residents of the Maldives. UNDP and Germany’s Deutsche Post DHL Group are partners in Getting Airports Ready for Disaster (GARD), an initiative that trains airport managers on keeping these vital hubs functioning in tsunamis, earthquakes, and other crises, so they can process incoming humanitarian relief supplies. Nearly a thousand people at 40 airports worldwide have been trained. Two massive hurricanes unleashed fury in the Caribbean, causing catastrophic damage in September 2017. To kick-start recovery in the region, UNDP helped inspection teams in Dominica and Barbuda assess damage using high-tech tools to collect data in real time — assessing a building in an average time of seven minutes. All the structures in Barbuda were assessed in five days — a fraction of the usual time. UNDP is now scaling up the technology to provide country offices with the tools to gather, analyse and act on real-time data, expediting the disaster recovery process. Healthy ecosystems are at the heart of development, underpinning societal well-being and economic growth. Through nature-based solutions, such as the sustainable management and protection of land, rivers and oceans, we help ensure that countries have adequate food and water, are resilient to climate change and disasters, and can sustain work for billions of people through forestry, agriculture, fisheries and tourism. An important part of this work involves helping governments to access global financing facilities established to advance environment-related challenges like climate change, cloroﬂuorocarbon emissions or loss of biodiversity. UNDP manages the second-largest portfolio of projects funded by the Green Climate Fund, for example. In 2017 alone, UNDP country ofices have managed 840 environment projects in 141 countries, valued at $3.6 billion, and leveraged another $15 billion in co-financing for environment and sustainable development priorities in these countries. With these funds, UNDP creates nature-based solutions that balance two imperatives: secure, restore and sustainably manage natural resources, while also protecting the environment that enables human life to ﬂourish. The environment affects all areas of life, and so our work in this area means progress on all the SDGs. Worldwide, 100 million tonnes of peat are sold to heat homes, fertilize fields, and produce electricity. It’s big business — and a devastating one. That’s because peat traps carbon, up to 500 million tonnes of it in Belarus alone. The fewer peatlands there are, the more carbon is released into the atmosphere. A grassroots movement has successfully pressed for strict limits on peat mining. With support from UNDP, Belarus is expanding its network of natural reserves, and preserving the environment. Perched in the Himalayas, the country of Bhutan is vulnerable to health risks posed by changes in its climate — diarrheal diseases are now widespread, and dengue fever, never detected in the country before 2004, is now endemic during monsoon season. With support from UNDP, the government is tracking data on the links between climate and disease. The result is a national health system with more advance warning for climate-sensitive diseases, and a country with greater resilience to climate change. In the Democratic Republic of the Congo, UNDP supports a solidarity group that has rallied support among the indigenous peoples of Momboyo forest to protect 2,000 hectares of forest from which they derive their income. A regional coordinator of that group, Régine Mboyo, also won an Equator Prize for her work as head of a network of 43 indigenous peoples’ organisations nationwide. That network helped stop concessions for over 600,000 square kilometres of forest and maintain a moratorium on the allocation of extractive industry concessions in the rainforest. The Poverty-Environment Initiative of UNDP and the UN Environment Programme provides financing and technical support to countries the world over to help government decision-makers and other stakeholders manage the environment in a way that improves people’s livelihoods and leads to sustainable growth. So far, the initiative has provided support to 47 national development plans and over 4,400 local plans in 17 countries. Azerbaijan’s economy depends heavily on oil and gas, leading to high levels of carbon dioxide emissions. UNDP collaborated with the country’s state oil company to introduce environmentally-friendly driving habits through training and smart technologies, such as an eco-driving simulator, which was tested by the company’s ﬂeet of 1,000 drivers. The drivers reduced fuel consumption by up to 15%, preventing 1,500 tonnes of carbon dioxide from entering the atmosphere. Given its early success, the programme is set to expand nationally. People can’t prosper without reliable, safe, and affordable energy to power everything from lights to vehicles to factories to hospitals. And yet more than 1 billion people worldwide have no access to energy, and nearly 3 billion people use solid fuels to cook or heat their homes, exposing their families to grave health hazards and contributing to vast deforestation worldwide. In these and other ways, energy is connected to every one of the Sustainable Development Goals. UNDP helps countries transition away from the use of finite fossil fuels and towards clean and sustainable sources of energy. Our sustainable energy portfolio spans more than 110 countries, representing around $1 billion in grant financing, and leveraging close to $6 billion more for this goal from public and private sources. For years, Moldova struggled with the rising costs of importing 97% of its energy, most of it imported gas. UNDP launched the country’s most ambitious renewable energy project, introducing biomass energy — which uses locally-produced, carbon neutral agricultural waste — to hundreds of schools and other public institutions. So far, over 190,000 people across 216 villages and towns have switched to green technologies, creating nearly 800 new jobs, and reducing heating bills by 20%. Whereas in 2011, only 3% of Moldova’s energy consumption came from renewable sources, that proportion is now 15%. One in seven people in Lebanon lives without electricity. UNDP is working with the UN Refugee Agency and the Lebanese Government to provide affordable energy and encourage the use of renewables. These investments are going towards streetlights that make women feel safe at night, lights at home so people can study and work, and heat so that families can stay healthy. In another project, UNDP is helping provide stoves and environmentally friendly briquettes to the most vulnerable people in the North and Bekaa regions. UNDP is helping distribute 1 million portable solar lanterns donated by Panasonic to schools and health centres in northern Kenya, making it possible for kids to read at night and patients to get care. The lanterns can get recharged only at school during the day, providing an incentive for students to attend. The lanterns are clean and safe, and are replacing kerosene lamps that pose a fire risk and health hazard; they’re expected to reduce greenhouse gas emissions by 30,000 tonnes through 2018 alone. With funding from the Green Climate Fund, UNDP partnered with the European Investment Bank on a project to retrofit public buildings and apartment buildings in Armenia, to make them more energy efficient, thereby reducing an estimated 5 million tonnes of CO2 emissions over the life of the project. China is the world’s largest consumer and producer of energy, and the largest emitter of greenhouse gas — 30% of the global total. The country’s demand for energy is increasing, especially in the transport sector. Clean hydrogen can be made from renewable resources and has zero emissions. UNDP worked with the Government to test hydrogen fuel cell-powered buses, and now five more cities are joining the effort to test such vehicles. UNDP’s initial investment has helped hydrogen fuel cells grow into a $12.6 billion industry in the country. Women and girls make up a disproportionate share of people in poverty, and are more likely to face hunger, violence, and the impacts of disaster and climate change. They are also more likely to be denied access to legal rights and basic services. Women’s participation in all areas of society is essential to make big and lasting change not only for themselves, but for all people. As the UN’s leading development agency, UNDP has the ability and responsibility to integrate gender equality into every aspect of the development effort. Gender equality and women’s empowerment is a guiding principle that applies to everything we do. Our work on gender ranges from the political to the economic and beyond. It includes support in more than 60 countries to end gender-based violence. We are also working in more than 40 countries to advance women’s political participation as parliamentarians, elected officials, in climate action and disaster risk reduction efforts, and in mediation and peace processes. We also work at the community level, such as by supporting women in starting their own businesses and helping women farmers gain equal access to and control of resources, financing and land. UNDP pushes for gender-responsive budgeting at all levels of government, making sure that the needs and contributions of women are taken into consideration in all development policies and plans. During Colombia’s long civil conﬂict, sexual violence was prevalent in areas with armed fighters — as many as a half-million during the first decade of the century. With the conﬂict now over, UNDP is supporting survivors of sexual violence to rebuild their lives with dignity, by providing them with access to health, protection, psychosocial and legal care, and other forms of reparation. The project has trained officials on how to investigate sexual violence, documented over 1,600 cases, and promoted reparations or compensations for nearly 1,000 survivors. Educational opportunities for women and girls in Afghanistan are paltry; school enrollment for girls is only 36%, and higher education is just as limited, especially in rural areas. With UNDP support, Kabul University launched the country’s first-ever master’s degree programme in Gender and Women’s Studies. The course aims to produce a cadre of gender equality champions who will fill posts in politics, education and other sectors. In 2017, the first class of 28 students graduated from the two-year programme. Demand for spots in the programme is high and is expected to grow. With support from UNDP, the number of women in positions of political leadership in Algeria has soared in recent years. The country’s 2008 constitution promised to secure equal access for women to leadership positions, and, since 2010, UNDP has backed Algeria’s efforts to fulfill that pledge. Our expertise in support of a law to improve women’s participation in government, among other efforts, helped increase the number of women elected to local government posts from 1% to 18%, and the number of women in the national assembly quadrupled. Today, with over a quarter of the 462 seats in the National People’s Assembly held by women, Algeria ranks second in the region in women’s political participation. With European Union funding of €500 million, UNDP works with UN Women, the UN Population Fund, and other partners on the Spotlight Initiative to End Violence Against Women. The initiative responds to all forms of violence against women and girls, recognizing that this effort is essential to achieving Agenda 2030. UNDP partnered with Microsoft and the National Council for Women (NCW) in Egypt to launch Social Innovation Hubs for Women in Cairo and Ismailia, and a third is planned for Alexandria. Each hub promotes entrepreneurship, social impact projects, and income-generating opportunities for women. The effort aims to reach 5,000 women initially, and then expand to districts nationwide. In addition, UNDP partnered with NCW to launch an innovation camp for young people to help design an app to report violence against women. No single entity alone can achieve the 2030 Agenda — the Sustainable Development Goals are a declaration of interdependence. Delivering on the promise of the SDGs will involve or affect every country, every economy, every private company, every non-governmental organisation, every academic institution, and every UN agency. The breadth and depth of UNDP’s partnerships is already unparalleled. Few organisations work as closely as UNDP does with such a wide mix of partners — public and private — across so many different contexts. But the challenges the world faces requires even more. To better help the countries and people we serve, UNDP will build new and stronger partnerships with governments, the private sector, international financial institutions, non-profit organisations, academia, and others. The 2030 Agenda, with its targets and deadline, gives us a clear foundation on which to forge longer-term partnerships. For over 50 years, UNDP has valued the trust of all its partners, and understands that such trust must be earned. From artificial intelligence to climate change, the world is on the cusp of dramatic changes. For this reason, a dynamic, effective and future-focused UNDP is needed now more than ever. That kind of UNDP — the one we envision in the new Strategic Plan — will be possible only with the continued support and close collaboration of our valued partners. UNDP focuses on helping countries achieve their development goals. Countries are at the centre of our partnerships. From Afghanistan to Zimbabwe, UNDP provides expertise, networks, and other resources to 170 countries as they face their own specifc challenges. UNDP recognizes the important role that academia can play in understanding and addressing the world’s most pressing development challenges. We partner with top academic institutions in Africa, Asia, Europe, and North America. UNDP partners with regional associations such as the African Union, the European Union, and the Association of Southeast Asian Nations (ASEAN). These partnerships are tailored to the needs of the region and the partners, and focus on a range of issues, such as public health, good governance, disaster risks and resilience, human rights and the rule of law, access to justice, and gender equality. UNDP’s private sector experience is underpinned by strong relationships with governments, deep understanding of development, and expertise in sustainable business. In 2017, we worked with thousands of businesses, from the largest of global brands like Microsoft and Visa, to small companies, social enterprises, and local cooperatives. These partnerships mean more effective action in all the programme areas in which UNDP works. UNDP’s engagement with international financial institutions (IFIs) is critical to help governments leverage additional financing, expertise and advocacy for greater development impact. UNDP currently works with 15 IFIs (including multilateral, regional and national development banks with international objectives), such as the World Bank, the Islamic Development Bank, and the Asian Development Bank. Established in 2004, the Joint UNDP-UN Department of Political Affairs Programme on Building National Capacities for Conﬂict Prevention brings together the development and political arms of the UN to enhance the organisation’s support to countries in sustaining peace. The Joint Programme has worked with over 50 countries and supported national architectures for peace, mediation, and dialogue. It brings a multi-faceted approach to conﬂict prevention, capitalizing on the diversity of the UN system. For example, UNDP and DPA have been working closely together with the Government of Papua New Guinea and the Autonomous Bougainville Government (ABG) in preparing the steps for a referendum on the future constitutional status of Bougainville, to be held by the end of 2020. In Yemen, UNDP received a $300 million World Bank International Development Association grant for a three-year project (2016-2018), providing short-term employment and service restoration in over 300 districts, supporting local institutions to create over 9 million working days for 400,000 families, and helping 2.5 million Yemenis access basic services. Agriculture is a main source of income in Ethiopia, and farmers are vulnerable to erratic rainfall, crop failure, and other effects of climate change. UNDP collaborated with government ministries and two insurance firms in Ethiopia, Oromia and Nyala, to provide farmers with crop insurance. If rainfall is below a certain threshold, the company pays insurance claims while UNDP covers the insurance premium. Over 12,000 smallholder farmers have already benefited. 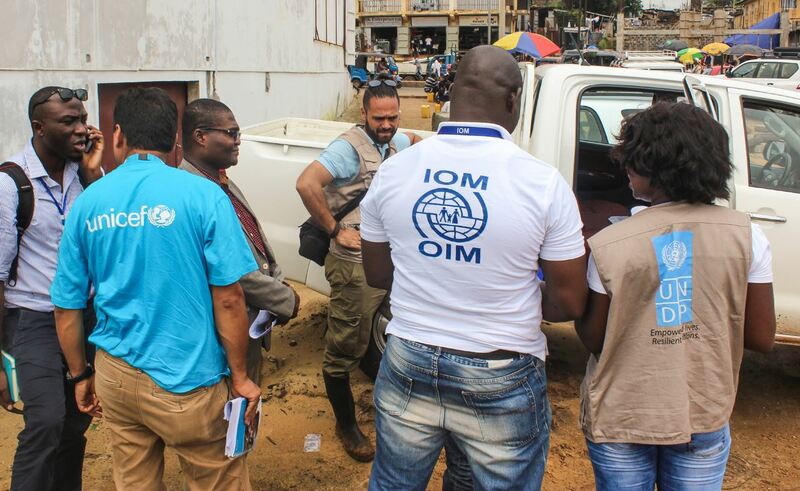 In 2017, after a mudslide in Sierra Leone killed hundreds and displaced thousands, UNDP worked with government agencies such as the Office of National Security and UN entities such as UNOPS. Here and elsewhere, UNDP works with partners of all kinds to ensure the best results. UNDP is a vital part of the UN family, and facilitates much of the work of other UN agencies. We administer payroll for approximately 17,700 non-UNDP personnel across the system. We provide shared premises and common services for agencies in 113 countries, and close to $700 million in financial services to the system. In addition, UNDP administers the UN Capital Development Fund (UNCDF) and UN Volunteers (UNV), and hosts the UN Office of South-South Cooperation (UNOSSC) and the Multi-Partner Trust Fund (MPTF) Office. In this and other ways, big and small, UNDP is essential to the entire UN system’s efforts to achieve the SDGs. The UN Capital Development Fund, administered by UNDP, makes public and private finance work for the poor in the world’s 47 least developed countries. UNDP administers the UN Volunteers programme, which in 2017 mobilized nearly 25,000 UN Volunteers in 131 countries and online; they represented 159 nationalities. Hosted by UNDP since 1974, the UN Office for South-South Cooperation promotes, coordinates and supports South-South and triangular cooperation globally and within the United Nations system. UNDP houses the Multi-Partner Trust Fund Office, which allows multiple donors to pool their funding to support large-scale projects and initiatives of the UN system and national governments. UNDP is rightly judged by those we serve and partner with on how well we’re able to measure and deliver results. This level of transparency and accountability is a hallmark of UNDP. But UNDP is not content to rest on the progress that we’ve worked with countries to achieve. That’s why in UNDP’s new Strategic Plan we commit to enhance our business model, cultivate new partners, and, as always, work globally across sectors and the Sustainable Development Goals. That means ever-greater results in the years to come, and maximum impact for every dollar invested. In 2017, contributions totalled $4.9 billion, an increase of 1% over 2016. UNDP distinguishes between regular resources, contributed annually for its core activities and functioning, and earmarked resources, contributed for a specifc activity, project, or theme. Regular resources decreased to $0.612 billion from $0.618 billion. Earmarked resources, excluding reimbursable support services, increased to $4.22 billion from $4.16 billion. This includes contributions from programme country governments to projects in their own countries (government cost sharing), which grew to $1 billion from $892 million. In 2016, UNDP launched a number of Thematic Funding Windows. Through these Funding Windows, contributors can invest in a particular thematic area while allowing UNDP to allocate the funds to the activities and locations where they are needed the most. The Funding Windows also make for lower transaction costs on financial contributions as compared to other earmarked modalities. Flexibility and lower costs means better results. Total contributions of $99 million have been received through the Thematic Funding Windows since their launch. June 2017 marked the historic Ocean Conference, with its powerful message about global interconnectivity: the ‘seven seas’ are, in fact, one shared ocean. 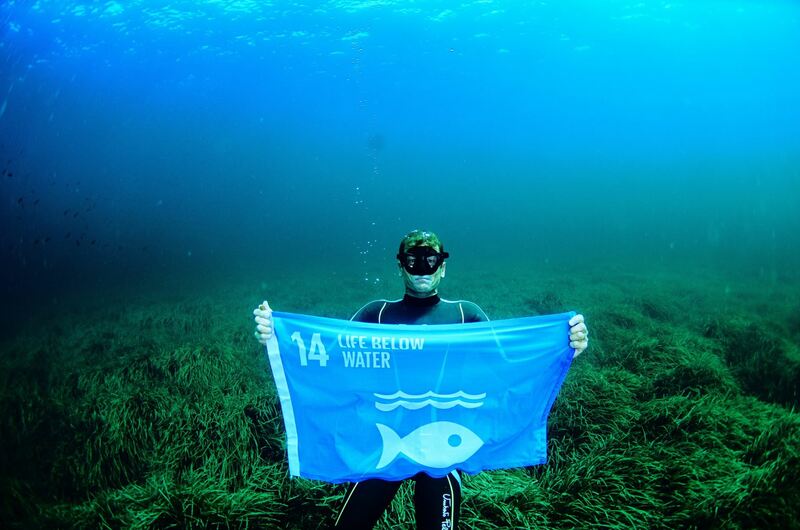 With the support of UNDP, this game-changing event secured more than 1,300 commitments from the international community to protect the ocean. UNDP works with over 100 countries to restore and protect life under water, and better manage marine resources. From reducing the risks of marine-invasive species to creating protected areas in Belize, or safeguarding fishing livelihoods in India, UNDP is tackling many urgent threats to our life-sustaining ocean. 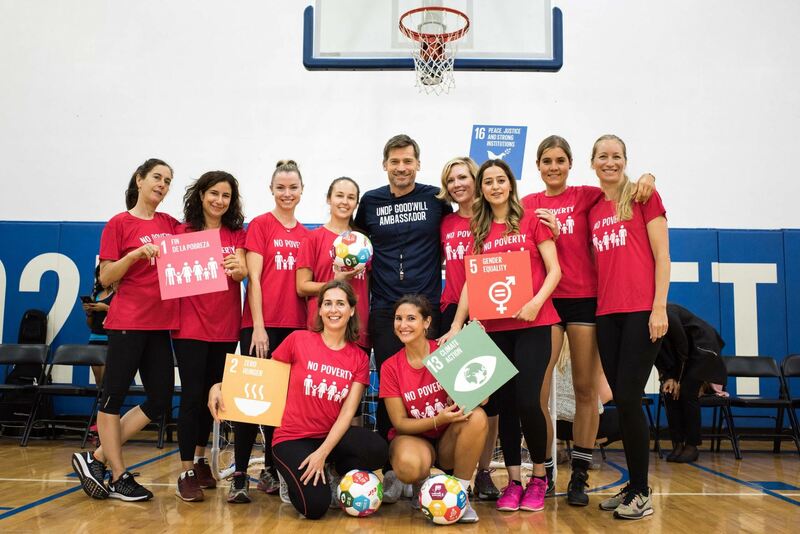 UNDP is a major partner in the Global Goals World Cup, an open women’s soccer tournament that fuses sport, teamwork, and advocacy for the Sustainable Development Goals. 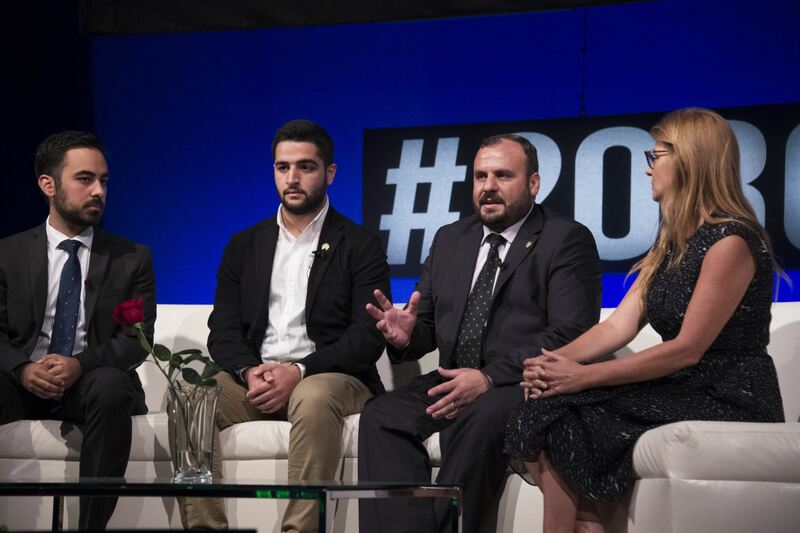 In September 2017, the winning teams from each tournament met in New York City for the 2nd Global Final, helping to kick-oﬀ UN General Assembly Week. Participants included a team from Liberia championing universal access to clean water, a team from Ecuador fighting for quality education, and a local East Harlem team striving to end inequality. UNDP leaders were active in events in and around the 2017 UN General Assembly. UNDP Administrator Achim Steiner hosted a high-level side event on “The SDGs in Action,” and also presented the awards to the 15 winners of the 2017 Equator Prize for climate action, at a ceremony at The Town Hall theatre in New York. Also during GA Week, UNDP released a landmark report on income inequality in Africa as well as a short film on the joint work of humanitarian and development actors in Somalia. In November 2017, UN headquarters held the CARICOM-UN High-Level Pledging Conference — an event to engender support to build more climate resilience across Caribbean countries. With over 400 high-level representatives from governments, multilateral and civil-society organisations and the private sector in attendance, UNDP emphasized the need for a new financing architecture to address Small Island Developing States (SIDS), such as the ones aﬀected by Hurricanes Irma and Maria earlier in the year. The conference’s message to “Build Back Better” resonated; participants made over $1.3 billion in pledges, and over $1 billion in loans and debt relief. In November 2017, the Conference of the Parties (COP23) was held at the World Conference Center in Bonn, Germany, under the Presidency of Fiji. 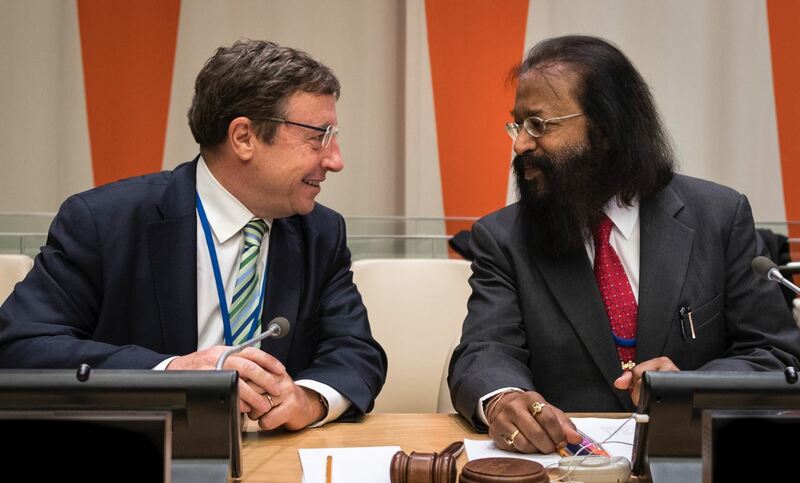 UNDP’s delegation — led by Administrator Achim Steiner — participated in 30 key events during the conference. With the Paris Agreement and national climate targets in place, UNDP’s focus has transitioned to supporting countries’ shift into accelerated action and implementation. In conjunction with COP23, UNDP also helped initiate the Pathway to Paris “Chorus for Climate Action,” a star-studded, sold-out concert at Carnegie Hall in New York City. In September 2017, the Social Good Summit (SGS) examined how we can unlock technology’s potential to make the world a better place. Held annually during UN General Assembly Week, SGS unites a dynamic community of global citizens and progressive thought leaders around the theme of #2030NOW. Organized by UNDP in partnership with the UN Foundation and Mashable, the Summit featured a ﬂagship event in New York City, with five panels led by UNDP leaders or Goodwill Ambassadors, and events in 87 other countries, from Madagascar and to Albania, Myanmar, Tunisia, El Salvador, and others.